Most of the following applications and data files are for handheld Computers based on the Palm OS platform. These include the classic Palm III and V series, the Tungsten, Zire and later Palm organisers, IBM WorkPad range, Handspring Visor and Treo series, Palm Treo range (Palm OS models), Sony CLIE range, Garman iQue range (Palm OS models) and Tapwave Zodiac. 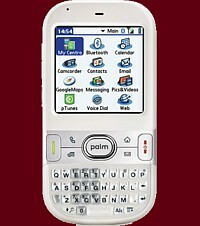 For a complete listing see the List of Palm OS Devices article. This platform was probably the first successful mass-market handheld computer range, launched with the Palm Pilot 1000/5000 models in March 1996. In 2000, industry analysts IDC estimated that Palm held just over 80% of the handheld computer (PDA) market in both America and Western Europe. The final Palm OS device released was the Palm Centro smartphone in October 2007, which proved very successful due to its compact size and low cost, with over 1 million sold in the first six months, resulting in Palm's share of the American smartphone market being 13.4% in the first three months of 2008. The Centro (shown at left) is still available in mid-2009. 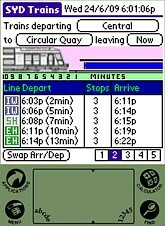 A Palm OS Emulator Styletap, is also available for Windows Mobile (PPC) and Symbian OS smartphones. The following applications and data files are freeware, but the application SydTrains, though currently free, requires registration for full functionality (contact the publisher via the link provided). All timetable data files are made available as a public service, to facilitate use of the public transport services to which they apply, and also for the purposes of research, education and study in the fields of scheduling, timetable publication, and software design. Please note that public transport timetables can be changed by the providers without notice, and similarly, scheduled services can also be delayed or cancelled. For critical journeys, passengers should check service operation in advance by contacting the official Sydney Transport Info-Line 131500. Program counts down minutes to go to next scheduled departure, as well as displaying current time, and time and destination of the next two departures. Departure timetable infomation for each specific location is read from the inbuilt Palm Memo database, with memo selection to choose the desired departure location. Each memo holds the timetabled departures covering all days of the week, with the day selected manually using "up" and "down" buttons. 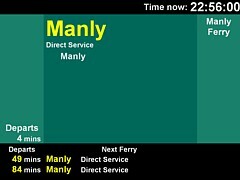 The program display has been modified to better suit ferry services. Application verified on Palm IIIe (3.1), Palm Vx (3.53), Palm Vx (4.10), IBM WorkPad c3 (3.53), Handspring Treo 180 (3.52), Sony Clie TJ35 (5.21), Palm Centro (5.49) and StyleTap for Symbion OS (0.9.011). 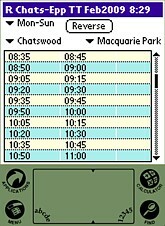 Program displays all timetabled services between any two selectable locations, as well as displaying the current timetable name and the current time. 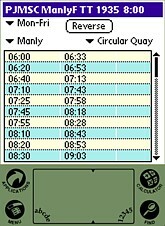 Departure timetable information is read from databases, with user selection of service/route. Each timetable database holds the services covering all days of the week. The departure and arrival locations and the day of the week are selected by drop down menus. Palm application v1.0 verified on Palm Vx (4.10), Sony Clie TJ35 (5.21) and Palm Centro (5.49) only. Palm application v0.4.8 verified on Palm IIIe (3.1), Palm Vx (3.53), IBM WorkPad c3 (3.53) and Handspring Treo 180 (3.52) and the above. Program displays services between two selected locations at a chosen time. The display counts down minutes to next scheduled departure, as well as displaying current time, and departure time, line, number of stops and destination arrival time for the next five departures. Timetable information for the system is read from a database, with user selection of departure and arrival locations. Five routes can be stored for quick retrieval. The departure and arrival locations and the departure day and time are selected on screen. Also has train arrival and departure animation for real time mode. Application verified on Palm IIIe (3.1), Palm Vx (3.53), Palm Vx (4.10), IBM WorkPad c3 (3.53), Handspring Treo 180 (3.52), Sony Clie TJ35 (5.21), Palm Centro (5.49) and StyleTap for Symbion OS (0.9.011). A major limitation is that the Sydney railway lines appear fixed in the database compiler program, rather than being read from the compressed html data files, so additional routes and modes can not be simply added in via new web pages. 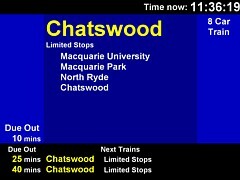 For example there is no option to select the new Chatswood-Epping line, even if correctly formatted timetable data for this is included in the zip file. No current timetables are available. 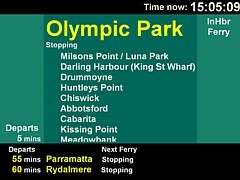 Program shows services departing a selected location on a nominated line or route, with the display based on that used for the Sydney suburban platform indicator plasma screens. It is primarily designed to display the list of destinations served, and will scroll the list when there are more than can fit on the screen at once. In addition to the destinations, the program displays the number of minutes to the next scheduled departure, the current time, and shows the destinations and minutes to the following two departures. Timetable information is read from a database, with user selection of departure location, direction and line. The program database can be extended beyond the Sydney railway network, to other modes of public transport and even to historical timetables, providing the original web timetable page html syntax is exactly matched, so the database creation parsing routine can function correctly. 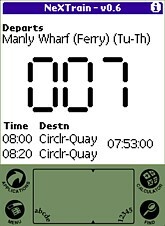 Modification of the tdb.dll file enables the display to be improved to suit other modes of transport (but remains fixed). Alternative timetable web pages must include a dummy Illawarra down page for Central to enable the TrainDB program to sucessfully start for the first time after installation. Application verified on Windows 2000 and Windows XP. A major limitation of the current version of this program is that it does not filter services that only run on particular days of the week (e.g. Friday only, Saturday only and Sunday only). 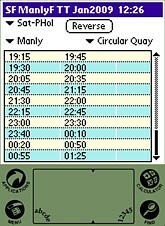 As a guide, this makes the display incorrect for late night rail services, late night Manly ferry services and most weekend inner-harbour ferry services, and it should not be relied upon for these services at these times. Note this problem is only due to the TrainDB application, not the original data files (which correctly flag such services) and has nothing to do with Railcorp or Sydney Ferries (so please don't contact them about it). 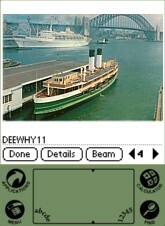 Note for use with ferries, on the TrainDB Screensaver Setup screen select the desired wharf via "station" and note the "up" direction is services towards Circular Quay and "down" is away from Circular Quay. The following applications are freeware. Program displays images contained in photo album resource files, produced by companion creation software running on a Windows PC. The Palm viewer program lists all of its album files installed on the device to enable selection of the desired collection. The display of pictures is manually advanced, with no slide show or audio capability. The resource file creation software automatically resizes each image to maximum dimensions of 160x140 pixels. Application verified on Palm IIIe (3.1), Palm Vx (3.53), Palm Vx (4.10), IBM WorkPad c3 (3.53), Handspring Treo 180 (3.52), Sony Clie TJ35 (5.21) and StyleTap for Symbion OS (0.9.011).